We were trying to know each other, to understand our likes and dislikes. He was very courteous, polite, caring everything that a girl can dream of. Actually, more than that for he had all those polished manners you have only read about in the heroes of Mills and Boons stories and dreamed same qualities in the love of your life. But I must tell you, it is all in dreams. For by the end of our week long stay in a secluded, peaceful, out of this world place, I was bored to death. Though I never showed it, nopes not even once, but deep down inside I knew I was finding it hard to see anything interesting in our conversations. Since our courtship period, that was how our calls were - courteous. Everything was perfect and that's where the fault was. I was missing the tangy flavor, yeah the same effect that makes those gol gappas extra delicious. I was all hopeless with my Mr. Perfect until I saw him talking casually and playfully with the staff of the hotel as we were about to check out. He refused to reveal when I tried asking him. Now, that's not done. He can never refuse anything I want to know, can he? He doesn't have any choice. No, never a husband on this planet has the choice to refuse to tell a wife what she wants to know. It is every wife's right to know all the secrets of her husband. So how can he? And here started the tangy-ness - err, our first fight. After much of his pleadings and my crushing-beneath-my-heels-his-roses, he finally told me - "You like those small toiletries bottles of Biotique they have provided here in the rooms, right?". "So? ", I snapped. "Well, I have asked the staff to pack 5 sets of them for us." he said looking all what-would-you-think-of-me kind of nervous. "You are crazy to be paying them for that! ", I rolled my eyes on him. "PAYING!!???? Who the hell is paying? ", suddenly he retorted. "They are giving all those for free. You like it or not but I am full paisa vasool kinda guy, Roohi. It is a 5 star Hotel, I have given them good business, I owe this much from them at the least other than the mock-tails I have arranged not to be billed".. I couldn't believe my ears. My eyes gleamed with joy. The bells of my heart finally rang as I put my kajal (Kohl) as a dot on his cheeks to shield my hero from evil eyes :) And hence, our eternal love story began with a box of Biotique moisturizers and talc dancing in the background. For how much educated, liberated, modern I become but from the heart I will always remain desi, I mean pukka Indian like the bindi on Piku's forehead. I might go around the world, stay in luxurious resorts, speak in polished languages, but I will be somewhere the same local belle from U.P. loving those street chaats and the khitpit with the vendor bhaiyajis on food-hygiene and of course, their exorbitant (which actually is just fine) pricing. Without all such tussles, you see, we Indians get digestion issues. Really? You don't believe me. Oh come on! I mean why on earth we have a sidekick like stuff with every super hero kind main course meal? We have those papads (popaddum), pickles, chutneys (Indian Salsa), salts, churans/goli (homemade digestives powder/pills), aftermints and Gawd knows what kind of strange looking, yummy tasting, not so delicious delicacies. Yes, you are on the right track they all are for DIGESTION!! Every other day we need that kick of 'negotiating to get something extra'. Else our day goes like -"Today I didn't get good deal, I am upset so I'll overeat". "That guy didn't offer me something for free for my purchase. I'll eat fried food to cheer myself up". So now have you understood why all these bargaining, these little wars are so important to us? They are necessary for our biological system to function properly. Bingo. 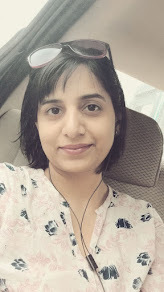 I can't tell you how much happy and independent of all those digestives is my tummy these days as we are traveling from one place to another thanks to such 'paisa vasool' tricks that my husband apply. And as we went International with Bali and opened our new travel Blog at "Soulful Excursions", I am all excited for our upcoming travel adventures. 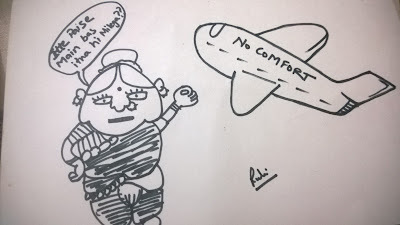 The only hitch I encountered was the declining state of comfort in the airlines. The shrinking and crummy leg space is crying about the horrific transitions and degradation that these jets and their services are going through. Where is the scope to haggle for that extra zing with them when they can't even provide you with even basic stuff like water bottles? I was all disappointed with all of them until I came across "Lufthansa Premium Economy". *Disclaimer: No Indian has wrangled with Lufthansa to provide these following facilities in the #LufthansaPremiumEconomy. The chair looks indeed comfortable with the extra space and legroom (good for my high heels footwear and my jumping toddler), much needed on a longer flight. A bottle of water is also provided to each guest which is an absolute necessity when I fly. They have also worked on little details like drink holder in the arm rest as the service begins pre-takeoff with refreshment in the form of mint-infused orange juice, proffered in a stemmed plastic glass. With a toddler in tow, I need not hurry here ordering my food unlike other airlines where the stewards and air-hostess hangs on the head, for in Lufthansa you can take your time choosing from the menu and enjoy your meal served on fine china tableware. Also, an amenity kit that includes the usual items like dental care, eye-pads needed for a restful and comfortable flight is provided. On long-haul routes an extensive in-flight entertainment on an 11- or 12-inch screen in the seat is in front of you. Aside from allowance for a second check in bag (life saver for a fashionable mom), a Premium Economy ticket entitles the holder to Lufthansa Business Class Lounge access for just an additional fee, and priority boarding, which is again a big respite for solo as well as family travelers. Don't ask me how we spent our night when our connecting flight from Malaysia to Bali was delayed! With such features in their Premium Economy class, I guess Lufthansa has given me lot of reasons to binge on Indian food like bakasur (a demon in the great Mahabharata infamous for his gorging habit) without having any digestive issues. It is like the airways have understood the Indian pulse. As if they have decoded our DNA structure while formalizing and finalizing the facilities. 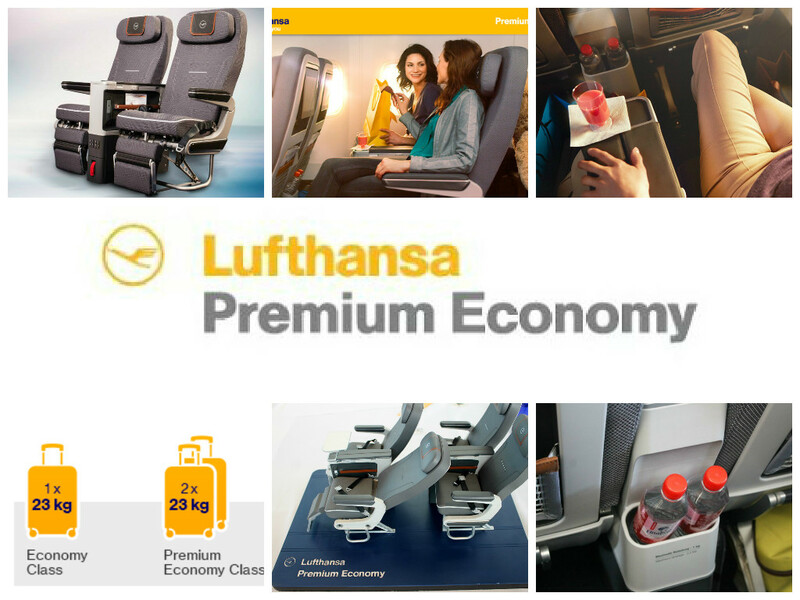 For now, we can simply upgrade to premium economy and get all these perks without doing any effort to showcase our charms! 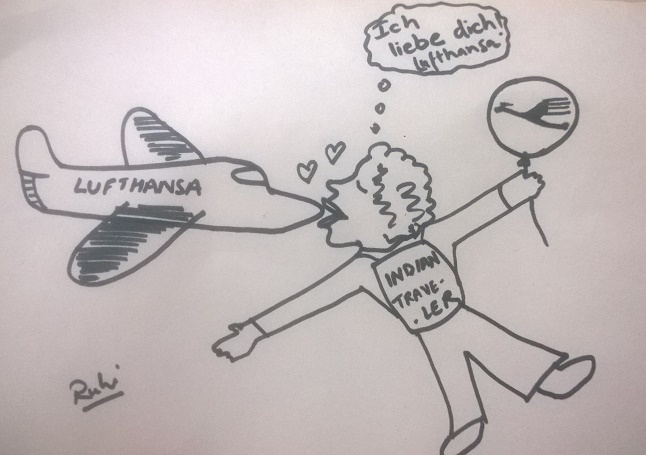 It seems another eternal love story has begun - of Indian Travelers with Lufthansa. 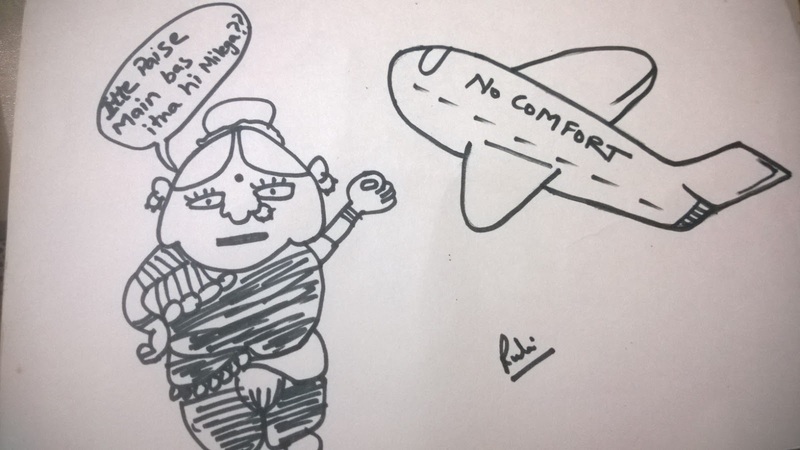 You're getting to be quite good at illustrations, Roohi. All the best for the contest. 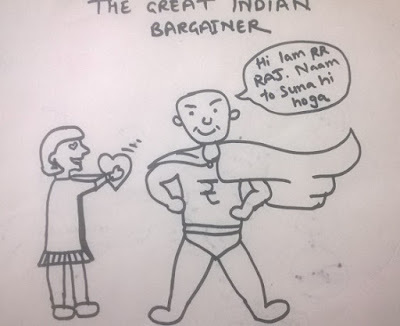 This is funny...a desi love affair with desi fundas. :-) ...The illustrations are good. Best wishes for the contest Roohi. I experienced almost the same feeling at the end of our one week honeymoon; but just a little better than bored to death :lol: Thoughtful illustrations. I know it consumes time but to come back to the post to connect to your memories through your words as well a hand-drawn picture is a beautiful feeling. Keep writing, Roohi. Love the way you narrate...all the best for the contest Roohi!